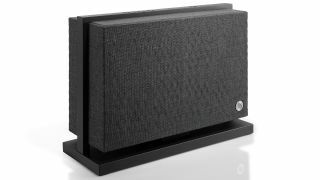 Audio Pro celebrates 40th anniversary with A40 wireless speaker | What Hi-Fi? Following the recent expansion of its Award-winning multi-room speaker range with the cylindrical A10, Audio Pro has now announced the all-new A40, a limited edition wireless speaker in celebration of the company’s 40th anniversary. The A40, which will have a limited edition run of 1000 (each individually numbered), has a rectangular, lunchbox-shaped design with two interchangeable grey fabric finishes, and an aluminium frame that serves as a control panel. On the top of the frame are five preset buttons that can be configured to, for example, a radio station or Spotify playlist, as well as playback controls to skip songs, change source and adjust volume. Like its siblings, the A40 offers vast network streaming and can work in a multi-room system via the Audio Pro app. There’s also Bluetooth, a 3.5mm input and Amazon Alexa voice control on the menu. In a bid to be as sonically successful as the rest of the brand’s line-up, it is equipped with two BMR 2in drivers, two 4in long-throw woofers and two 6.5in passive radiators – all driven by a 220-watt Class D amplifier. The Audio Pro A40 is available from December for £1000.